Think your behind the times if you’re not using Facebook or Twitter for your business? Now you can add another social site to that list as well. Foursquare is a social site that’s just celebrating its first birthday, and already has tens of thousands of users, and businesses adding their name to the lineup everyday. 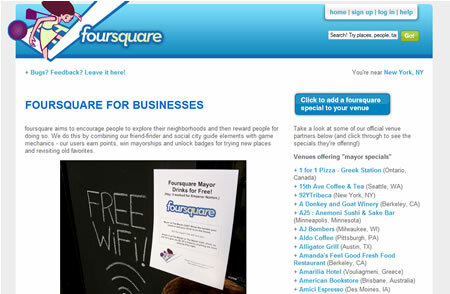 Foursquare combines a friend finder and a social city guide, along with game mechanics that allow users to earn points and received special prizes along the way. To join the Foursquare network, you start by downloading either the iPhone app or the Android app, or using a mobile website with other phones (a Blackberry app is in the works.) Don’t have a web browser? Not a problem – you can check in by sending text messages. Then when your out at a restaurant, bar, café, park – someplace you may want to connect up with friends, you simply check in via Foursquare. Every time you check in, you’ll be awarded points. There are different badges for a variety of things, such as discovering new places, and spending too much time in one location. As a business, where do you fit in? By watching who’s visiting of course. Foursquare offers a mayor badge to a person that has visited a location more than anyone else. When the mayor enters your business, you can offer them deals and enticements – how about a free drink or a free appetizer? You can even combine your social campaigns. Announce on Twitter a special for the first person to become the official mayor of your restaurant. It’s all about having fun, playing the game, and attracting a whole new crowd to your location.